People living in some of the most rural parts of Nottinghamshire are set to benefit from a further £2.7 million boost to fibre broadband. More than 2,500 homes and businesses in the Bassetlaw and Newark & Sherwood districts will be included in the next phase of the Better Broadband for Nottinghamshire (BBfN) scheme, after Nottinghamshire County Council awarded Openreach, Britain’s largest telephone and broadband network, a contract to deliver a third phase of work. It will move Nottinghamshire closer to every home and business having access to broadband and further enhance the county’s position amongst the most digitally connected areas in the whole of the UK. Around £30 million has been invested in Nottinghamshire’s digital infrastructure since the start of the BBfN roll out in 2014. Phase three of BBfN will see a further £2.7m investment, including £1.3 million from Nottinghamshire County Council, the government’s BDUK broadband delivery programme and £1.4 million from Openreach. The work will build on the 97.5 per cent of premises across the county that can already access faster broadband (speeds of 24 Mbps and above), thanks to the first two phases of the BBfN programme and Openreach’s own commercial rollout. 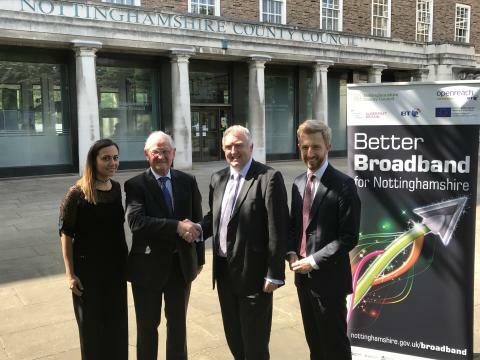 Councillor Reg Adair, Deputy Leader of Nottinghamshire County Council, said: “Our latest investment in the county’s digital infrastructure will see Nottinghamshire pushing towards 100% broadband coverage, which is great news for residents, businesses and the local economy. “More than 50 per cent of homes and businesses in the areas where we have rolled out our scheme have already signed up for faster broadband, which clearly shows demand is there. Detailed planning and survey work for phase three will get underway shortly, with the roll out expected to begin in Spring 2019 and take around six months to complete. And there’s further good news for the 2,500 properties included, with Openreach looking to use Full Fibre technology for this third contract in Nottinghamshire, meaning ultrafast speeds of up to 330 Mbps – around ten times quicker than the current UK average – available to all 2,500 premises. Homes benefitting from ultrafast broadband speeds can download a two hour HD film in just 90 seconds, a 45 minute HD TV show in around 16 seconds, or a nine hour audio book in just three seconds. Work carried out as part of the Better Broadband for Nottinghamshire programme is in addition to Openreach’s own commercial rollout in the county. Openreach provides the telephone and broadband network used by the likes of BT, Sky and Talktalk. So in Nottinghamshire, this means residents and business owners will still be able to choose from a wide range of broadband deals - they are not restricted to just one supplier. To find out more about the Better Broadband for Nottinghamshire programme, visit www.nottinghamshire.gov.uk/broadband .